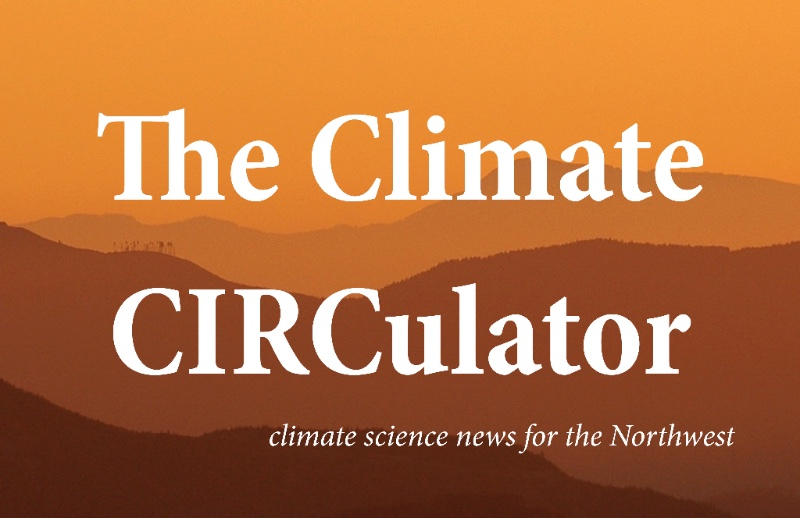 The Climate CIRCulator is a monthly newsletter covering climate science and the Pacific Northwest. Our posts are written by scientists and communicators at the Pacific Northwest Climate Impacts Research Consortium (CIRC), the Oregon Climate Change Research Institute (OCCRI), and the Oregon Climate Service (OCS). CIRC is a member of the National Oceanic and Atmospheric Administration (NOAA) climate adaptation effort the Regional Integrated Sciences & Assessments (RISA)program and receives funding from NOAA’s National Integrated Drought Information System (NIDIS). A state-funded organization, OCCRI is tasked with informing Oregon residents and lawmakers about the impacts of climate change. OCS is Oregon’s state climate office. CIRC, OCCRI, and OCS are headquartered at Oregon State University‘s College of Earth, Ocean, and Atmospheric Sciences (CEOAS) in Corvallis, Oregon. About: John Abatzoglou has been a CIRC team member since 2010. A climate and meteorology researcher at the University of Idaho and self-described “weather weenie,” John leads CIRC’s Northwest Climate Toolbox effort. He has participated in the creation of several CIRC-related Climate Tools, including Climate Engine and Integrated Scenarios. Kathie Dello, Associate Director of the Oregon Climate Change Research Institute. About: Kathie Dello is the Associate Director of OCCRI, the Deputy Director of the Oregon Climate Service, and works on CIRC’s Coping With Drought effort with the National Oceanic and Atmospheric Administration’s (NOAA) National Integrated Drought Information System (NIDIS). She is a regular contributor to the CIRCulator. About: Linnia Hawkins is a Ph.D. candidate studying atmospheric science at Oregon State University. Working with the Oregon Climate Change Research Institute since 2014, Linnia’s research interests include, regional climate modeling and the impacts of climate change on forests in the western US. She is a regular contributor to The Climate CIRCulator. About: Nathan Gilles is the managing editor of The Climate Circulator, and oversees CIRC’s social media accounts and website. When he’s not writing for CIRC, Nathan works as a freelance science writer. About: A professor of atmospheric sciences at Oregon State University, Philip Mote heads CIRC’s Climate Science activity. Along with co-leading CIRC, Phil directs the Oregon Climate Change Research Institute (OCCRI) and the Oregon Climate Service, and has helped co-lead several long-term research projects looking into the impacts of climate change. You might also find him rowing along the Northwest’s scenic waterways. About: David Rupp is a researcher for OCCRI at Oregon State University. He works on CIRC’s Climate Science and Climate Tools efforts. Interested in climate variability and change, and, in particular, in how these two factors impact the hydrological cycle and water resources, David’s work assessing how well Global Climate Models perform in the Northwest has become the foundation of much of CIRC’s Climate Tools and Community Adaptation efforts, including the Integrated Scenariosand Willamette Water 2100.